This is the first of three stories on how information technology and innovation are transforming industries and people’s lives. 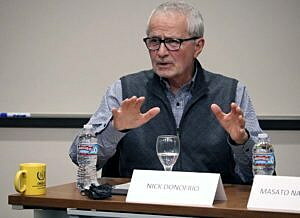 The topics were discussed during a roundtable reception with the leaders of IBM, Panasonic and the Washington Corp. at the University of Montana. The ability of computers to learn your habits and influence your behavior might sound like a bad dream of a futuristic world, one where cyborgs outsmart humans and rise to dominate the planet. The good news is, artificial intelligence can’t exist without humans making it. The bad news is – if it’s bad news at all – the technology is already here and it’s only going to evolve. 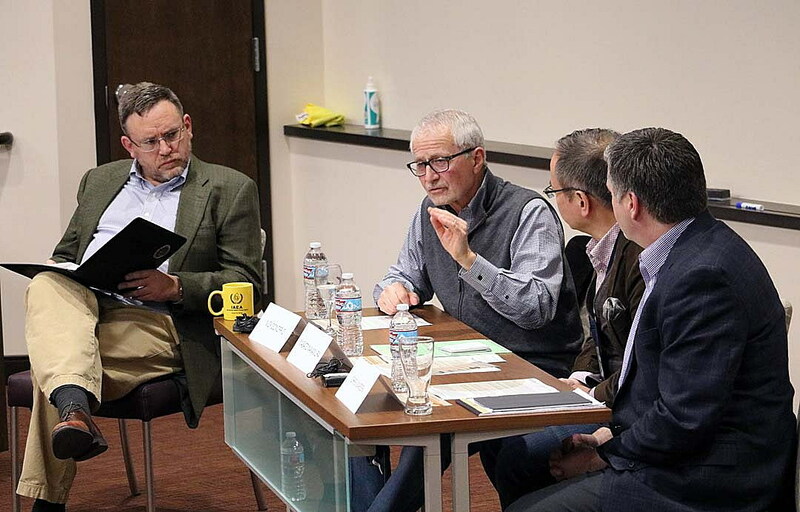 Philp moderated a panel of technology experts from IBM, Panasonic and the Washington Corp. this week at UM in a roundtable discussion on information technology and how innovation is transforming industry and people’s lives. Hosted by Accelerate Montana and the Mansfield Center, the discussion touched on a range of issues, from big data analytics to sensor technology. As it turns out, artificial intelligence may be a blending of the two, and the technology has been around for half a century, storing what most of us forget. Donofrio, who spent 44 years with IBM and helped fund the development of Watson (a $200 million project), described meta-data as “data that’s created on the way to getting to the data.” It’s often more important than the data itself, giving users powerful computational abilities. Machines have been learning for ages, a fact Donofrio branded as a primitive version of artificial intelligence. But coupled with new innovations, it’s becoming smarter and more powerful, and it will continue to evolve. While artificial intelligence can lead to philosophical debates among computer scientists, it also plays a practical role in everyday life, influencing how users interact with their iPhone or what they watch on Netflix. The evolution of technology also has implications for local businesses that use large amounts of data to streamline operations, improve the customer experience and enhance profits. Chris Warden, vice president of technology at the Washington Corp., views artificial intelligence as a blending of big data analytics and sensor technology. The results help the company run its trains with Montana Rail Link more efficiently. The ability to analyze and apply large amounts of streaming data has helped the Washington Corp. make smarter decisions based upon real-time needs. When Warden started with the company many years go, it looked at data compiled over lengthy points of time and responded to the results. But the company has evolved, finding “intelligent” ways to gather analytics. For Masato Nakamura, the director of international corporate affairs with Panasonic, the practical applications of technology and “machines that learn” are already rooted in today’s households, from washing machines to cooking appliances. Many of those are interconnected. If they aren’t yet, they will be soon.